ICAT’s courses range from two year part time professional actor training diploma’s and masterclasses to Shakespeare and weekend Intensives. Meet ICAT’s staff, a group of hugely experienced working practitioners. Find out what our current students are doing and which shows and showcases you can catch. A video gallery of exclusive, informal backstage conversations with hugely respected artists. A treasure trove of acting wisdom. Latest news and success stories from ICAT’s schools and graduate ambassadors. Sign up to our Newsletter and receive this FREE ebook as a gift! 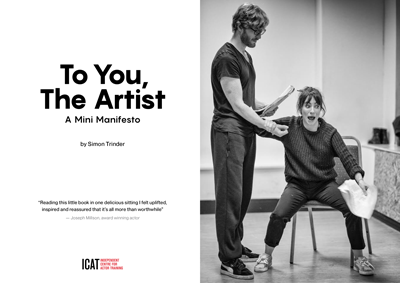 A short, inspiring manifesto for the actor, exploring the unique nature of what we do and celebrating the powerful creative drive in all of us.